Pragmatist: This glass is twice as big as it needs to be. Neutral: The glass is at half capacity. The glass is half-way. That’s it. It has water in it. thirsty: iam going to drink the water. If the glass was filled up half way, then it is half full. 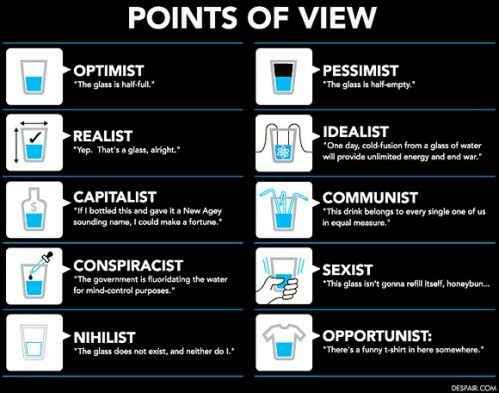 If the glass was filled up completely and then half of it was emptied, then it is half empty. In Earth’s atmosphere, the glass is always completely full. It is full of water and air.